Carrot cake is a sweet treat with a dense and moist consistency. For some, biting into a crunchy carrot in their slice of cake can ruin the indulgent experience and make the cake less appealing. 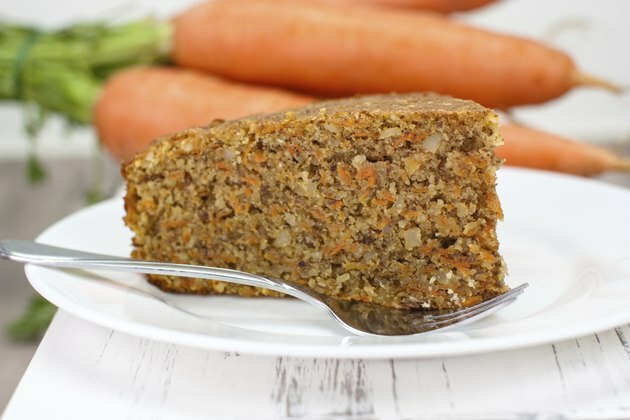 To avoid crunchy carrots in carrot cake, you must soften them before adding them to the batter. Select crisp, bright carrots and rinse them under cool water, while scrubbing their exterior to remove dirt and possible pesticides. Use a vegetable peeler to remove the carrot's outer layer, working from the top to the tip of each carrot, and then cut off the tops of the carrots with a sharp knife. Discard the tops and peelings. Select the finest holes on a cheese grater and shred the carrots carefully. Alternatively, attach a shredding blade to a food processor to grate the carrots faster. Use the grated carrots in your carrot cake, as they soften quickly during the baking process. If you do not enjoy the consistency of grated carrots in carrot cake, which is still slightly detectable, you can mash or puree the carrots instead. Forgo the grating process and bring a large pot of water to a boil. Cut the carrots to 1-inch sections after peeling them and removing their tops. Place the cut carrots in the boiling water and allow them to cook for 10 to 20 minutes, or until a fork easily pierces them. Drain the water and transfer the carrots to a large mixing bowl. Use a potato masher, or the back of a fork, to mash the carrots to a smooth consistency. Alternately, transfer the carrots to a food processor and pulse it until they form a smooth puree. Use the cooked, smooth carrots in the cake as directed by the recipe. For a quick carrot puree, carrot baby food works in place of the cooked carrots. Preheat the oven to 350 degrees Fahrenheit and coat a 9-by-13-inch cake pan in a thin layer of oil or cooking spray. Use a light cooking spray to cut calories. Blend four eggs, 1-1/4 cups of vegetable oil, 1-1/2 cups of white sugar and 2 tsp of vanilla in a bowl. Stir in 2 cups of all-purpose flour, 2 tsp of baking powder and 2 tsp of ground cinnamon. Add 1-1/2 lbs of carrots along with 1 cup of chopped pecans. So long as the carrots are grated or pureed, they will soften when you bake the cake. Pour the batter in the pan and bake the carrot cake for 50 minutes, or until a toothpick poked in the center comes out clean. Allow it to rest in the cake pan for 10 minutes, and then turn it out on a rack to cool completely before icing or cutting. You can make the recipe low-calorie with light oil and a sugar substitute. However, using a sugar substitute slightly alters the consistency. If the cake does not fall from the pan when you turn it on a cooling rack, try sliding a butter knife around the edges of the pan to loosen it. For a carrot cake that broke apart when you removed it from the pan, place it in bowls and top with icing, syrup or frosting for an appealing dessert. Do not open the oven halfway through the cooking process, because this can cause the center of the cake to sink. Place the cooled cake in an airtight container and refrigerate it to prevent spoilage. If you use a cream-based icing, refrigeration is particularly important. Concise Encyclopedia of Foods and Nutrition; Audrey H. Ensminger et al. How Many Calories Are There in a Slice of Carrot Cake?